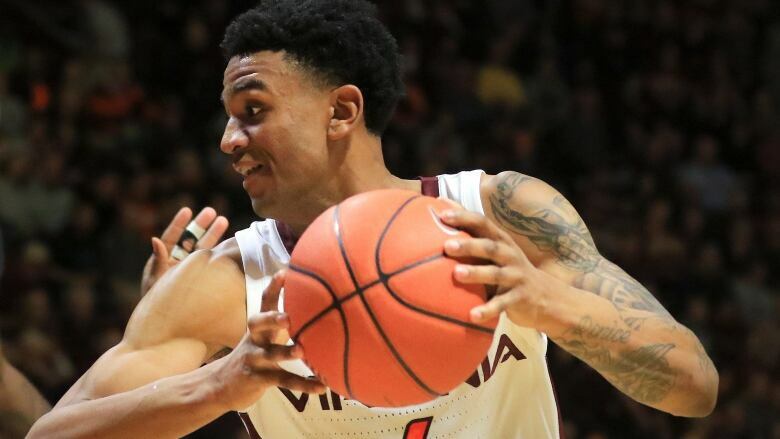 From Hamilton, Ont., to Hamilton Heights high school, Virginia Tech guard Nickeil Alexander-Walker almost always teamed up on the court with his cousin Shai Gilgeous-Alexander, now with the Los Angeles Clippers. Their next game will likely be against each other — in the NBA. From Hamilton, Ont., to Hamilton Heights high school, Nickeil Alexander-Walker almost always teamed up on the court with his cousin. Besides a brief AAU stint and some legendary one-on-one battles, Alexander-Walker, 20, played with Shai Gilgeous-Alexander, also 20, nearly his entire life. In fact, when asked when they started playing against each other, Alexander-Walker was sure to correct a key word. "I've been playing with Shai for my whole life. It wasn't until high school when he moved far out from Toronto that I started playing against him," said Alexander-Walker. "And then we started to team up again for our final two years of high school." It was at Hamilton Heights Christian Academy in Chattanooga, Tenn., where the Canadian cousins began stamping their hyphenated names onto the NCAA map. Shai had committed to Florida in October 2016, but a strong showing opened more doors and eventually landed him in the vaunted Kentucky program. Nickeil, meanwhile, chose Virginia Tech over USC and Maryland. It meant the cousins would be pitted against each other, but also handed the reins to their own teams. Any potential matchups would evoke the one-on-one days. The winner of those games depends on your perspective. "It was competitive, it was fun, it was good times. There were fights," said Alexander-Walker. "He would always win one-on-one but the fights would go the other way." The cousins only wound up playing against each other once in their college careers, a 93-86 win for Kentucky in which neither cracked 10 points. Their next matchup will take place in the NBA. Shai was selected 11th overall by the Charlotte Hornets in the 2018 draft, but traded that day to the Los Angeles Clippers. The guard has excelled, making the rising stars game at all-star weekend and helping the Clippers to a likely playoff spot. Nickeil, meanwhile, chose to return to Virginia Tech for his sophomore year — a decision that's paying serious dividends. Alexander-Walker increased his scoring output to 16.6 per game this season after hovering just above 10 in his freshman year. The 20-year-old upped his per-game numbers in every significant category for the Hokies, including a jump of nearly 10 minutes per game — a vote of confidence from coach Buzz Williams. "I've been watching film a lot, getting into the gym and working on more of a main primary ball handler type role, making reads off ball screens, picking my spots," said Alexander-Walker. "I think the game has slowed down for me which is allowing me to play more free." Accordingly, Alexander-Walker has shot up draft charts. The six-foot-five point guard possesses some of the key tools necessary in today's NBA. He's a good three-point shooter and his length at point guard allows him to switch freely on defence. Strong transition offence helps make Alexander-Walker a complete package. Still, there are some weak spots. His shooting, while strong overall, can be streaky, and a lack of elite athleticism diminishes some of his length advantage. Alexander-Walker says the key to NBA success is in his head. "I feel like my IQ is getting better and I'm smart enough to play at that level. I can play off-ball and on-ball so I'm more versatile. I pride myself in defence," said Alexander-Walker. The prospect profile reads similarly to Shai, and what Nickeil lacks in athleticism he makes up for in shooting. Unsurprisingly then, many mock drafts have the V-Tech star landing in the middle of the first round. But before the draft process begins, Alexander-Walker first must return to the NCAA Tournament, where as an eight seed last season the Hokies fell by three points in the round of 64. This season, Virginia Tech enters seeded fourth, with a game against Saint Louis on Friday at 9:57 p.m. ET to kick things off. Alexander-Walker says he's relying on experience and increased preparation and time in the film room to help vault his squad further. "Just gonna enjoy the moment again. A kid from Scarborough can't ask for more. I always dreamt of doing [this] and I always worked towards it but it wasn't set in stone," he said. Joining Alexander-Walker in the big dance are a number of Canadians also starring for their schools. Lindell Wigginton of Dartmouth, N.S., led Iowa State to a sixth seed, Toronto's Oshae Brissett helped power Syracuse to eighth and Ignas Brazdeikis, a dual Canadian and Lithuanian citizen, helped Michigan to a No. 2 seed. And then there's R.J. Barrett, overshadowed by fellow star Zion Williamson at Duke but still a projected top-five pick and key starter on the title favourites. Alexander-Walker's Hokies defeated Barrett's Blue Devils in February, and he says it's fun seeing other Canadians do well on a big stage. "You wanna take that label off from Canada and show [everyone else] that we do have winning basketball players that can play," said Alexander-Walker. Canada will have a chance to do just that at the World Cup in China in September, where Alexander-Walker says it would be an honour to represent his country. "I almost feel like an ambassador for basketball, to compete and show that Canada isn't just a one-sport country," said Alexander-Walker. "It's stories and things that you get to tell your future kids and grandkids. It's an accomplishment that sticks to you forever." Before Alexander-Walker focuses on the NBA draft or the World Cup, he has his eyes set on March Madness. "The fact that I'm able to keep going dancing with my teams is magnificent," he said. At this time next year, he'll be duelling against Shai in the NBA. Perhaps there will be less fighting.